By Sue Chan - New Zealand - 12 Jun/03 - Viewed 2281 times. We arrived at Auckland, New Zealand�s largest city with a population of around 1 million, at 6.15pm (3.15 Aust time) and all went well. Fortunately Annette had booked us a hire car. We received a Toyota Corolla, which we found very convenient. Other people without a booking couldn�t get a vehicle because of the number of America�s Cup Visitors. We had booked at Mountain View B&B at Mangere Bridge not too far from the airport and had been given very clear instructions for finding it. Jenny and Ian Davis the hosts were very friendly and helpful � a good start. Next morning � Saturday - after a cooked breakfast with four other guests, which was very pleasant we left with a copy of Jenny�s directions to see the sights. The weather was a bit overcast but no rain. Our first stop was One Tree Hill, at 183m the second highest of Auckland�s volcanic peaks and once a Maori fortress. Evidence of Maori fortifications can still be seen. From here there are good views across the City and Harbour. The name One Tree Hill was given by early European settlers because of the native N.Z. Totara tree growing on top. A party of disgruntled workmen cut down this tree in 1852 and attempts to re-establish the Totara failed. It was replaced by a Pinus Radiata which survived for many years before being vandalised several times causing it to become unsafe. The Auckland Council removed it on 26 Oct 2001. There are plans to replant a series of smaller trees near the summit. The land was give to the people of Auckland by Sir John Logan Campbell in 1901. 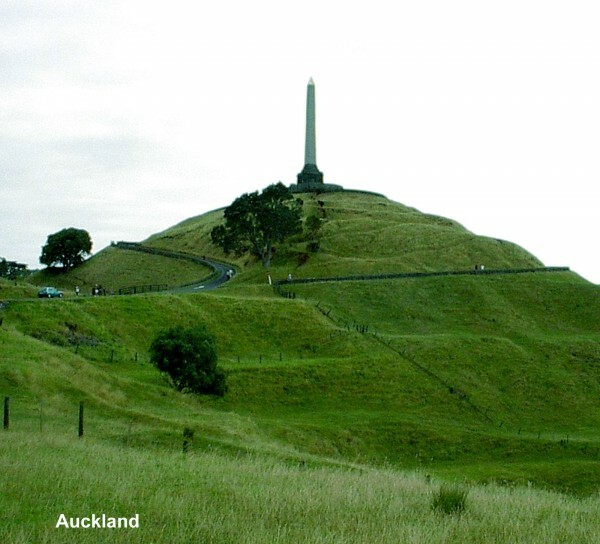 The 33 metre high Obelisk on the top of the hill was completed in 1940 � the Centennial year of the signing of the treaty of Waitanga � as a record of Campbell�s admiration of the Maori race. At the base of the hill is Cornwell Park where we had coffee at the Garden Restaurant then visited the restored Huia Lodge. This Queen Anne Style cottage was built in 1903 as the Caretaker�s home and is now the Park Information Centre. Across the road is Acacia Cottage, built in 1841, once the Campbell home. It was moved to the park in 1920. Near the park gate there is a bronze statue and fountain built in 1906 to honour Campbell. Following Jenny�s directions we came to Mt. Eden, the highest peak at 196m, a closer viewing point for city views and also a former Maori pa site. We then visited Highwic House, built in 1863 by Alfred Buckland, a farmer, auctioneer and racehorse owner. The large Gothic-style house was extended over the years as the owner became wealthier and his family became larger � he had 21 children! By the time the last child was born there were 24 grandchildren so there would have been some great family gatherings. Leaving here we came to St. Mary�s Cathedral, built in 1886 across the road from its present site. The building is of Kauri timber and was moved in one piece in 1982. The stained glass windows were reinforced with plywood on both sides and were not damaged. It had to be jacked up 7 metres so it would be above road level and 24 house-moving trailers were put under it. It also had to be rotated 90degrees when it reached the other side! The assistant at the door had some tales to tell of that day. Holy Trinity, built in 1973, is next door and the largest church building we had ever seen with an impressive stained glass window (of course we have not seen European Cathedrals). We then went to the Domain where the Wintergardens two glasshouses were built in the1920s. In one we saw beautiful begonias as well as other temperate climate flowers, and in the other tropical plants like the ones at home in Queensland. We had lunch at the Tea Kiosk - built as an example of an ideal home for the Great Industrial Exhibition in 1913 - overlooking the duck ponds, then drove around the Domain, past the War Memorial Museum (which we decided we did not have time to visit) and on towards the city. On the way we visited a Rose Garden and eventually came onto Quay Street. We continued on into the city, which seemed like any other city, and found parking in Crown Plaza where floors 8 � 13 were for public parking. (We stayed almost 3 hrs. $12). We took our bearings and walked through to Queen Street. The shops did not impress us and we made our way to the Sky Tower, at 328m the tallest structure in the southern hemisphere. We went to the main observatory level 186 metres up. Ron is not good with heights so we only stayed long enough to watch some brave people bungy jumping from further up and take some photos. Unfortunately it was not a good day for pictures but there were good views. Outside we boarded the free city bus. This took us through the main shopping area and down to the quay where the America�s Cup Village was purpose built for the first New Zealand defence of the America�s Cup in 2000. It was very busy there near the wharves and we did not think we wanted to get into that. The races were held in N. Z. again this year. Some had already taken place but the next would not be held for several days as the conditions were too calm. Unfortunately this year N.Z. did not win. We found our way back to Mangere Bridge by following the road to the airport. Once we lost it and took some time to get back to it but as it was only in the suburbs there was not much traffic and we arrived back at 5.45pm after a nice day. Next morning we decided to give the city a miss and � armed again with Jenny�s directions � we set off for the west coast. This was drive four in the book Annette had given us and looked very interesting. We had no trouble following the directions � so they must have been good � and our first stop was the Arataki Visitor Centre with viewing platforms and displays as well as a carved entrance. We continued on the road to Piha where we took a photo from the top of the hill before continuing down to the black sand beach where we had smoko. This was a strange beach with rocky outcrops, one called Lion Island. We bought food for lunch and got directions to the Glen Esk Waterfall. The sign said 30mins � so we took almost 1 hour. On the way we sat on a seat and ate our lunch. It was a bit steep but well worth the walk. (2.83km on the pedometer). Leaving Piha via Piha Road we turned into Karekare and travelled along a 4km narrow winding road to another black beach. This beach was used in the film Piano. It was a 10min. walk from the car park through a creek. We were glad the tide did not come in while we were there! From the car park we walked 10mins in the other direction to the Karekare waterfall only a short distance from the road. We left at 4pm and were back at Mangere by 4.45pm. It was an interesting day. On Monday we said goodbye to Jenny and Ian and left at 8am to head north. We were directed today around Auckland so we did not have to go through much of the City and after only 45mins through the suburbs we reached SH16. Our first petrol purchase 114.5 per litre! We reached Helensville, our first stop by 9.25 and the Kauri Museum at Matakohe by 11am. This museum has an interesting collection of memorabilia and displays depicting the hard life of the Bushmen as well as kauri furniture and the world�s largest display of kauri gum. Outside is a Pioneer Church built in 1867 and a Post Office built of kauri, which was in use in the local area from 1909 to 1988. We spent almost 2 hours there then continued on to Dargaville where we had lunch and took photos of murals depicting the kauri timber port in the 1870s. By 2.30 we had reached the Waipouia Forest Visitor�s Centre (which was not worth driving into) and we continued to Te Matua Ngahere (Father of the Forest) Kauri Walk. Here we saw the �Four Sisters� a stand of four giant Kauri Trees encircled by a boardwalk. 2km further down the road we came to Tane Mahuta (Lord of the Forest) one of the largest trees in the reserve and more than 1000 years old. A boardwalk also protects this tree. Continuing north along Hokianga Harbour we drove to Rawene hoping to catch a ferry across the harbour and thus shorten our trip. Unfortunately the ferry had left about 15 mins before we arrived and we would have had to wait 45 mins. As there was nothing to do at Rawene so we decided to drive around. The short cut was 10km of winding, dusty, unsealed road driving into the sun so not pleasant but we reached Mangamuka Bridge on SH1 by 6.05pm earlier than had we waited for the ferry. We reached Kaitaia by 6.35pm and at 7pm arrived at our friends Bob and Betty Grange�s home at Pukenui a lovely spot overlooking Houhora Harbour and Mount Camel. We had travelled 480km, a long way for N.Z.